Mr C was busy finishing the greenhouse at the weekend so I thought I'd go out and help. Anyhoo, I got a bit distracted and started taking pics of our chickens and garden. I thought I'd share a pic of Mabel with you all. She'll soon be disappearing as the wall on witch she hangs gets covered in wisteria, so you may just catch a peak of her. 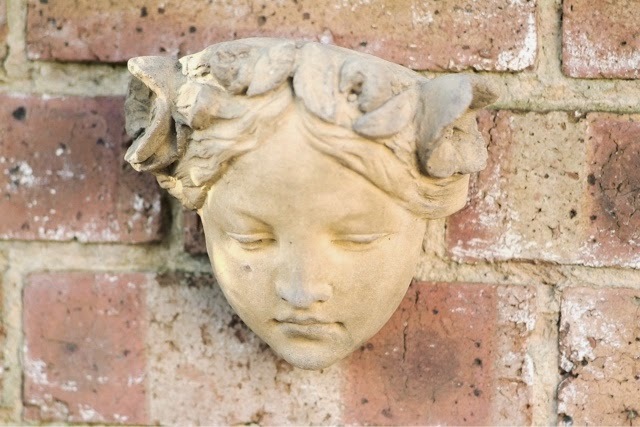 I love the way a bit of golden sunlight is passing down the side of her face, and I love adding little statues or figure heads to the garden. Pop them in an overgrown place to look like they have stood there for years. There's something very secret garden about them. I know I keep saying it, but I really am sooo excited for the coming of spring!